Explanation: Our Galaxy is filled with gas. Most of this gas is hydrogen, some is helium, but there is a trace amount of relatively heavy molecules, including carbon monoxide (CO) - a component of smog. The above wide-angle radio CO image shows the incredibly diverse structures that the molecular interstellar medium forms. 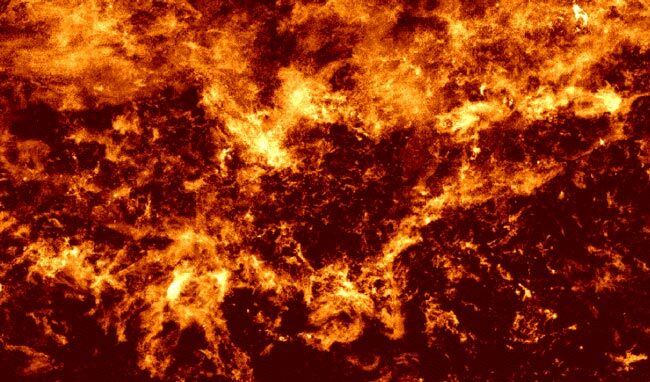 Dense clouds show where stars may be forming and open voids may indicate the action of strong winds from massive, recently formed stars. This FCRAO Outer Galaxy Survey was recently re-processed at the Dominion Radio Astrophysical Observatory for inclusion in the Canadian Galactic Plane Survey, an international effort to map all constituents of the interstellar medium over large scales at high angular resolution.